The role of music in life is so great that to make a point about it is to risk staleness. In fact, it’s one of the best indicators of a priori awareness. “We all know that,” silently remarks the hearer, when some correlation between melody and mind, song and soul, is pointed out. But most of the things we know about music tend to be related to the reactions it elicits. Music enlivens us, calms us, inspires us, undoes us—we react to it; it sets our feet going. Our lives are set to a metronome. Marches, waltzes, head thrashes, mosh pit jumps, whatever its mode, music plays us as much as we play it. Physically, we become the wind chime, the Aeolian harp, as the notes blow past and cascade through the pipes and strings of our bodies. Further, music is said to both sustain and substantiate us. It is the “food of love,” said the man of Stratford (Twelfth Night), and fit for “treasons, stratagems, and spoils” are those who have no music within themselves (The Merchant of Venice). Few would quarrel with these things; they are the time-tested effects of melody. As Kant said, music is the “quickening art,” and it takes very little to spark the fire. But these observations all deal with the present, with the consequences of a particular iPod track being played or a particular XM radio station blasting forth. We know best what music can do to the here and now. 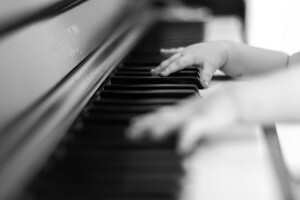 Suspected, but not as well understood, is the connection between music and the past—music’s role in memory-making and memory-retention, and even more remarkable, its connection with the future, in language acquisition. Scientists have been looking into these things over the past few years. And it seems that the brain’s medial pre-frontal cortex, located just behind the forehead, is the center for the music-memory interchange. Of course, this too we know on a subconscious level. Some songs we have to crank up because of what they put us in mind of, bouncing around the car as we blast our way to work. Conversely, some we have to turn off—again, because of what they put us in mind of, remembrances too bittersweet to stand at a given moment. Still, the role of music as catalytic converter is deepened by this observation. Music sparks memory, and memory—being the storehouse of the self that it is—reminds us of who we are. We recapture ourselves through recollection—i.e., collecting, again—the things that make us up. And what makes us up is not simply a matter of chemical compounds, a spreadsheet of elements in proportionate measures, but a constitution of experiences, of formative moments, of choices, for good and ill.
What we are is the scars of a lifetime and the stories that explain them—those won in glory, those won in infamy. Music brings it all back. The re-constitutional power of music is attested to by the effect it has on those for whom the paths of memory have become choked. Alzheimer’s and dementia patients “brighten” when they hear music with which they’re familiar. Patients that have been incommunicable are able to sing along with the tunes of their past and even to converse about them. That’s because the prefrontal cortex, the location of the music-memory complex, is among the last to atrophy. Neurologists at the Boston University Alzheimer’s Disease Center explain that emotional memories are the strongest and best-retained. Music acts as their summoner, ironically, because it’s associated with “procedural” memories—those that have to do with repetition—not with “episodic” memories, which help us place events within time. The diseases that attack memory mostly go after the parts of the brain that store episodes, not procedures. And the stock-taking of who and what we are—a process itself as crucial to existence as any other, if we admit that a “person” is more than a carbon structure—is a process that reaches far, far back. It transcends even the womb, with music playing a role in the foundation of selfhood. At The University of Würzburg in Germany, scientist Kathleen Wermke has found that early as the third trimester, fetuses can remember sounds they hear from the external world. They have “a particular sensitivity to melody contour in both music and language. The neonates produce different “cry melodies” based upon the patterns typical of the ambient language. Patricia Kuhl, Co-Director of the University of Washington’s Institute for Learning and Brain Sciences, says the finding shows that infants begin learning well before they are born. So it is melody that teaches us both what our first cry will sound like, and then how to go about making that cry; melody by which we score and memorialize our lives, and melody by which we recall them, even when time and age have clouded our way. Music at the first, music at the last. My what intricate and marvelous things we are, formed long before we’ve felt the warmth of sun or touch, long before air has broken through the border of our beings. While we yet swim within the reaches of our mother’s blood, the grand symphony of our souls is atuning. And all the while it hearkens to the notes and cadences, the bass and treble of the world within which we will soon play our song, before whom we will nigh burst forth in a great masterpiece of life.